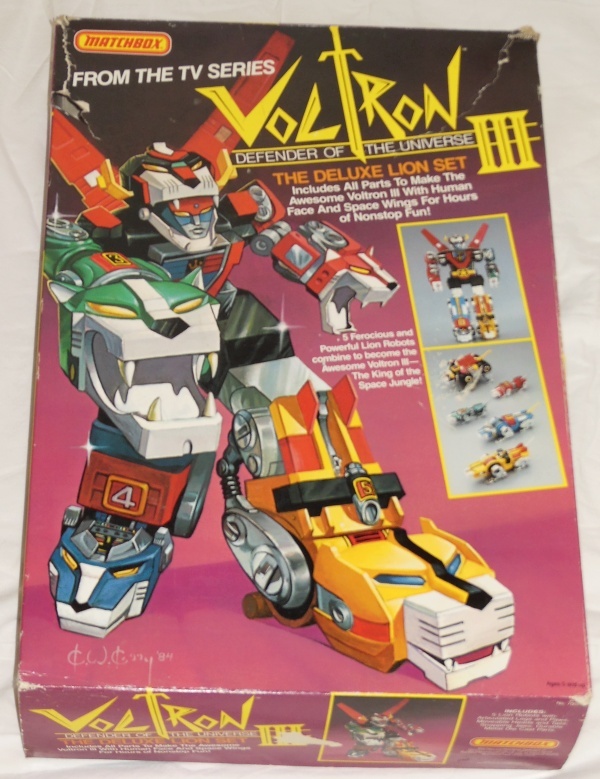 Here’s Golion aka Voltron and the cartoon image. He’s got a massive sword which I understand was not included in the Matchbox version, but was in the Bandai Godaikin release. 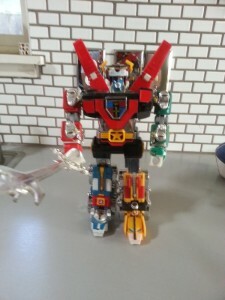 Popy gave these to us first as Golion GB-35 in 1981. This is the iconic robot from the 80’s. I don’t have anything bad to say about this robot. Golion has a great design and is a great ST version with the sword and shield. 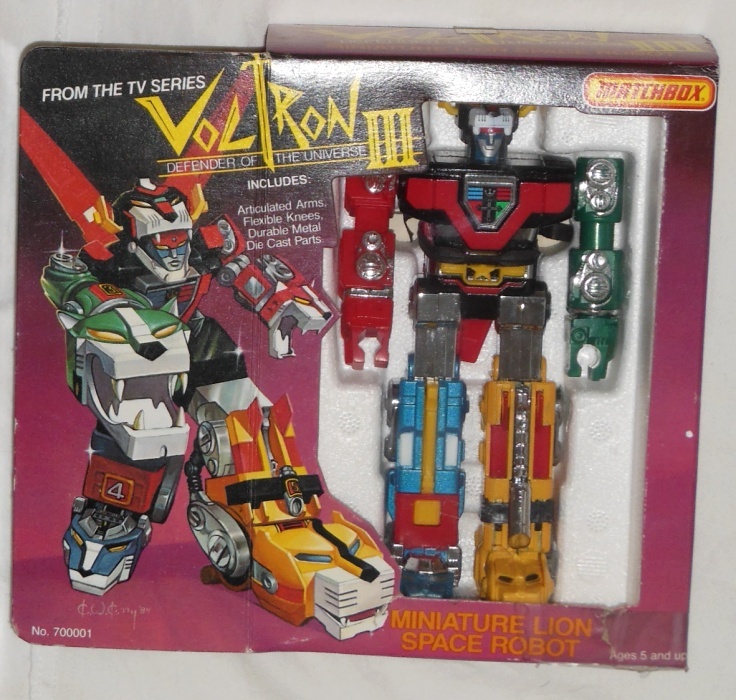 I have the Voltron version. 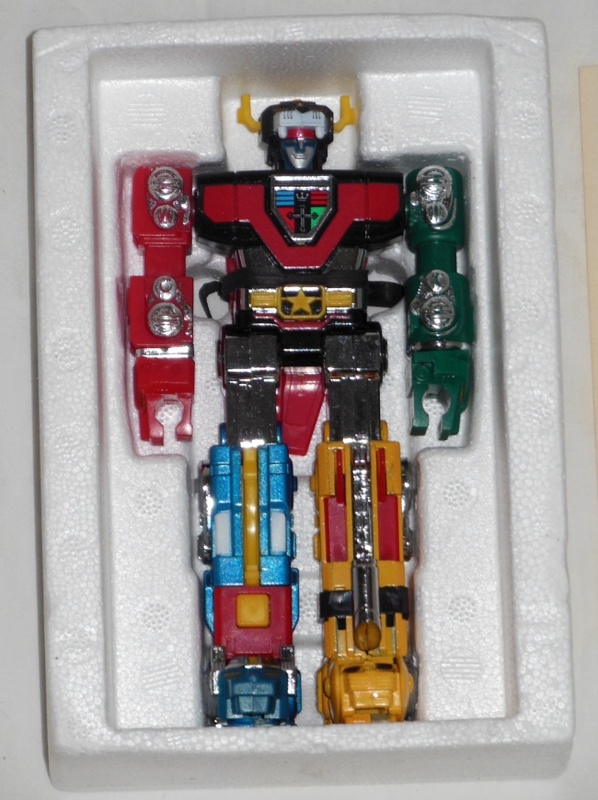 I wish the Voltron versions had a sword. 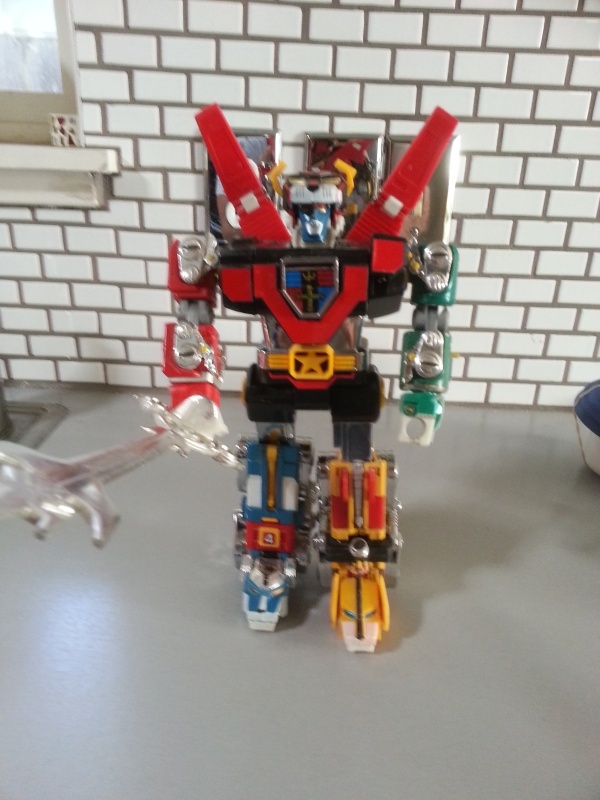 The DX and ST Voltron from Matchbox and do not have the sword or any of the Golion accessories and I have both. Guess I know what I will do if I ever get a 3D printer. I did not realize this one had never been opened. The tape and tie to hold it to the styrofoam are still there. Guess it’s opened once now, but as mint as it will ever be. Seems like the legs and the chest are die cast metal(only the head and arms are plastic) so it’s a pretty heavy robot likely making this one from its Chogokin line or roughly translated Super Alloy. If you notice, I mention that a lot. I am a fan of the old toys they made with metal. They seem more sturdy and substantial, like American cars from the 70’s. My little cousin clocked me in the head with an old metal Tonka truck I had and that one time, I wish it was plastic. The American version of the cartoon for this robot was pretty lame, but I can only say I liked a few robot anime. Getta Robo, Dangard Ace, Gaiking, especially Macross and Gundam. Not the American versions. 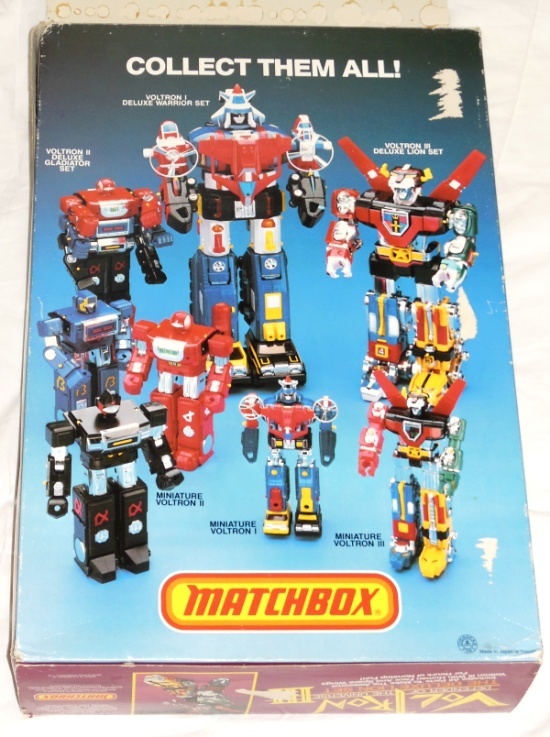 Hate Matchbox for depriving us of swords for Voltron, bastards. Anyway checked out a couple of the original Japanese Golion episodes and it was a much better. Seems like they made a lot of changes to the plot and removed the violence. 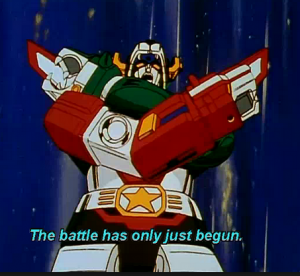 I heard the anime for GoLion was edited for violence, so I am definitely watching the Japanese version. Enjoy! Anyway I have a lotta love for this robot. 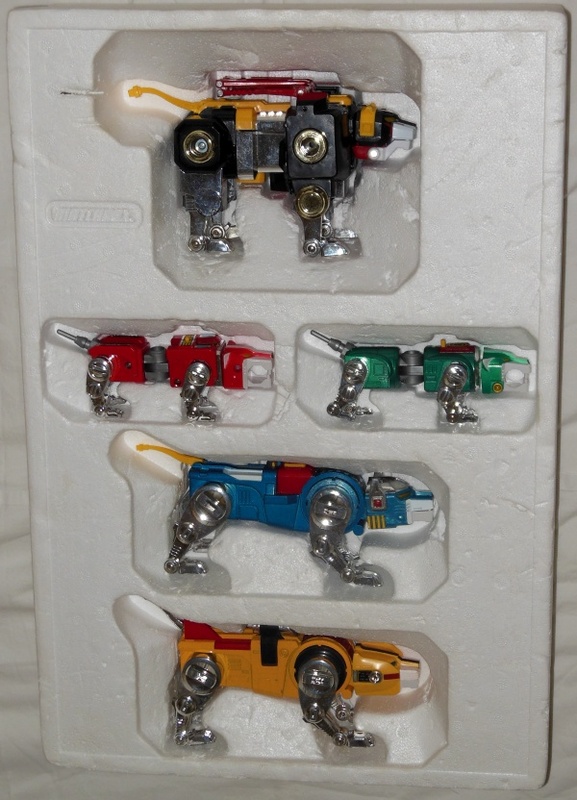 This robot has 5 lions that tranform into one of the best robots out there. Even the lions forms are excellent. I will have to pop him into robot form later for this post. This robot has been very popular over the years, so there have been a lot of releases. Lets see, Popy, Bandai America, Matchbox, Trendmasters, and now Toynami. 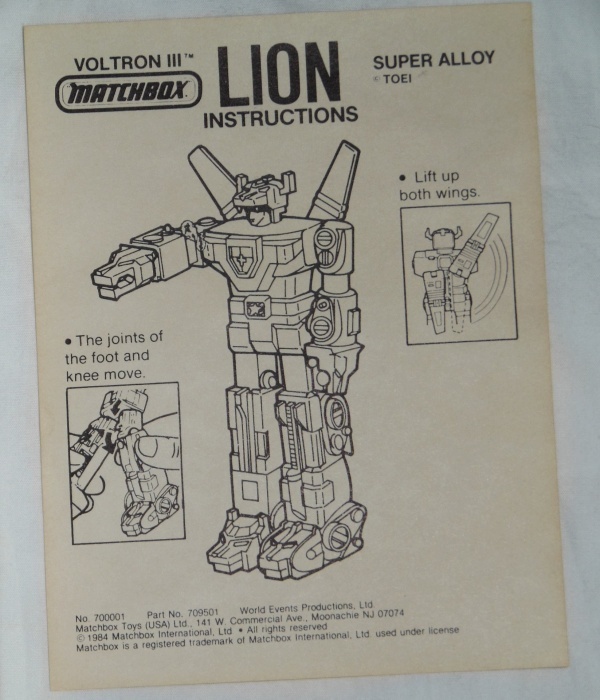 I figure they will release it again within the next few years, so maybe I can try picking up a new one with all the accessories or even the Lionbot set made from the original molds(but vastly inferior paint applications!). 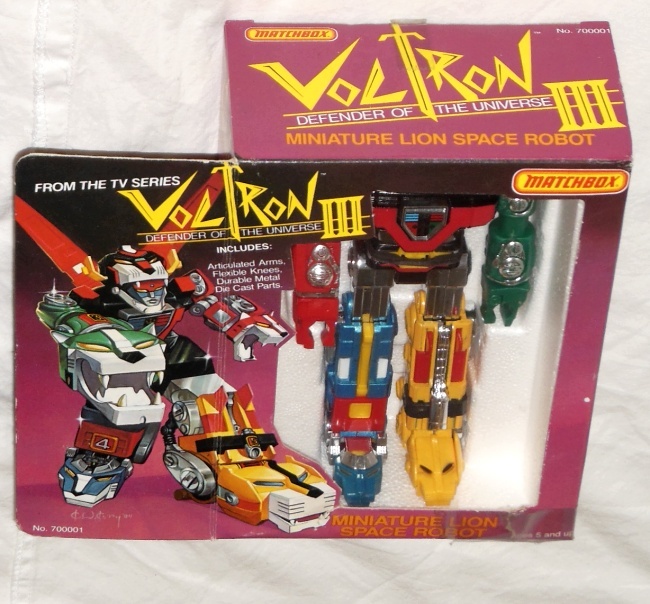 Matchbox Voltron III The Deluxe Lion Set from the anime Voltron: Defender of the Universe tv show from 1984-1985. See that styrofoam? Not a single accessory! The Popy and Godaikin versions had the full arsenal of missile launchers, daggers and a huge sword! 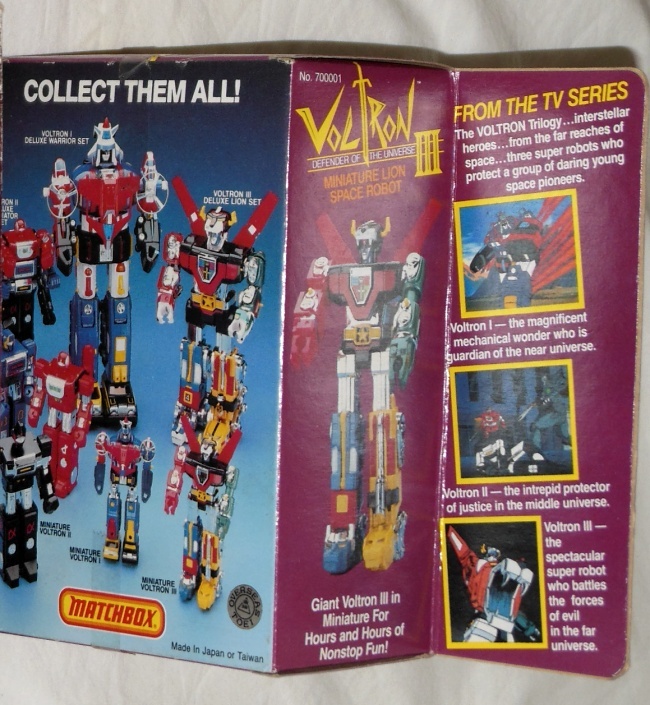 I picked up Voltron III as an adult and I was really disappointed in the castrated Matchbox Voltron. I gotta admit there is a bit more violence in the Beast King GoLion, than in Voltron. The story works a little better and I am actually enjoying the first episode. Checkout the anime tv show from 1981-1982.